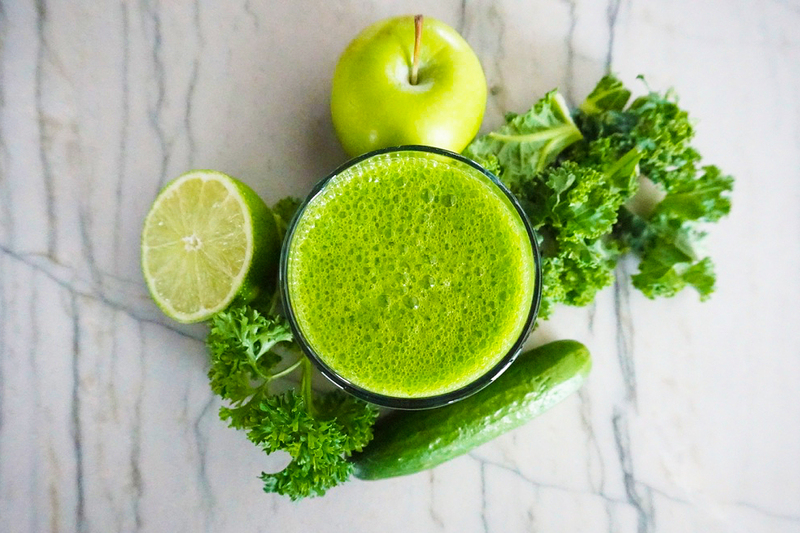 This delicious smoothie is powerhouse of vitamins and nutrients with anti-cancer and anti-inflammatory properties, promotes heart and liver health, opens your heart to love. 1 cup kale Providing a wide variety of nutrients, kale is among the most highly nutritious vegetables. With very high amount of calcium, carotens and chlorofill, kale can be used in multitude of dishes, including kale chips, soups, stews, omelets and smoothies. 2” of English cucumber or 1 small Persian cucumber Dating back to over 10,000 years, cucumber has incredible skin healing and repairing properties (think to all those pictures of women in spas with cucumber over their eyes). Silica – a trace mineral that cucumbers are rich in – contributes to the strength of our connective tissues. Cucumbers can alleviate skin inflammation, burns and swelling. 1 Granny Smith apple This legendary fruit is one of the most popular in the world with over 7,000 varieties available. Apple consumption is consistently associated with reduced risk of heart disease. 3-4 sprigs parsley Parsley is more than just a garnish. It is used as an ingredient in remedies for anemia and constipation, as well as a nerve stimulant, giving you an instant energy boost. 3-4 mint leaves One of the darlings in the kitchen, this yummy herb can not only freshen your breath, but also effective in resolving digestive issues. ½ cup green tea Green tea contains powerful antioxidants that help prevent cell damage. It can help lower cholesterol and improve blood flow. Polyphenols found in green tea have been shown to have anti-caner properties. Blend everything in a high-speed blender. Enjoy the benefits. This smoothie is a part of smoothies masterclass.